Let's pretend that you are in the market for a new sportscar. What should you get? Most people want a car that good-looking, fast and comfortable. It used to be that the idea of luggage space and sportscars did not go together, but that axiom is no longer true. So why not add a bit of practicality? Oh yes, when you first test drive your new sportscar, it should seductively whisper to you, "Buy me." I recently had the experience of having a test car talk to me. 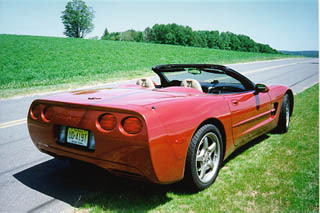 It was a 1998 Carmine Red Chevrolet Corvette Convertible. The leather seats were a nice shade of tan, known as Royal Oak. 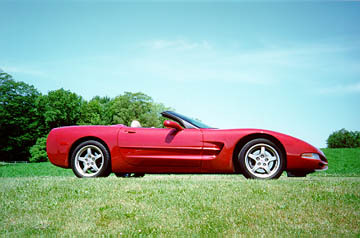 Like 70% of all 1998 Vettes it was equipped with a four-speed automatic transmission. It had an in-dash CD player and dual zone climate controls. While the idea of separate temperature zones being maintained in an open convertible is laughable, there is one big advantage to this electronic option. It does includes an outside temperature display. Other options included the seemingly obligatory floor mats and fog lights. Now the remaining option list comes down to two. This deep red beauty had the seldom seen Magnesium wheels. I like the way the thinner spokes expose more of the business-like brake calipers and rotors. Their bronze finish also looks particularly attractive with certain dark colors. These exotic beauties offer a savings of eight pounds of hard-to-handle-unsprung weight, and should offer some improvement in ultimate handling prowess in exchange for their $3,500 price tag. That leaves us with the $350 Z51 handling option. Your choice of Corvette suspension could be looked at as a personality test. Your selections include the standard suspension, the -51 option or the $1,700 real time selective dampening. The basic suspension offers a marvelous blend of supple ride and crisp handling. Yes, these meaty Goodyear Extended Mobility (Run Flat) tires do provide an excellent ride. Major credit goes to the engineers that designed such a stiff chassis, that the suspension could be tuned with more attention for bump absorption. The hydroformed main rails and balsa wood floor are big factors in keeping the tires flat on the road. Up front you'll find 245/45 X 17-inch skins, and 275/40 X 18-inch meats in the rear. My first guess was that Chevrolet's engineers tuned the basic suspension with the majority of buyers in mind. After all, when you are paying $40,000 plus for a car, it should come with decent dampers, supple springs and awesome anti-roll bars. Every C5 I've driven with the basic suspension never left me wanting more. This suspension is well suited for the majority of Corvette owners. My experience with what I call "the $1,700 switch" has largely been limited to C4 Corvettes. This console-mounted dial allows you to choose between Tour, Sport and Performance. It changes the settings in the shock absorbers in less than a second. In Tour the ride is noticeably smoother. Performance locks the shocks in their stiffest position. Sport means that you have the best of both settings. The shocks automatically adjust to changing road conditions. Some people find this high-tech solution the ideal one. Others say, Can't you make up your mind, and settle on one or the other? Now we come to the heart of the matter. Is the C5 a sportscar, grand touring automobile, or some mix of the two? If you immediately answered sportscar, than this discussion is academic. Of course you want the Z51's stiffer springs, meatier sway bars and beefier shocks. I used to feel that this option was for those individuals who wanted to autocross their Vettes or to take them to the track. I argued, "You only send a small percentage of your time cornering at the limit, you spend all the rest of the time evaluating the ride. Why compromise your comfort?" Yes, the Carmine Red Convertible did ride a bit stiffer than the previous C5s I've driven. But it rode a lot better than any of the previous C4s. Then I had an epiphany. I was rounding one of those freeway to freeway entrance ramps that change your course 270 degrees. There was no traffic and the red beast made me put my foot into it. As we tracked around the high-speed corner I heard, quite clearly, "YOU HAVE TO OWN A CAR THAT CORNERS LIKE THIS!" However fast we traveled around that ramp, the car was clearly capable of more. Whew! I would be remiss if I didn't mention the ease with which the C5's top goes up and down. By now you all know about the mellow power and great gas mileage the new LS1 engine produces. (I saw 27 mpg on one highway stint) Beauty may be in the eye of the beholder, but before you make up your mind, be sure to view the C5 convertible in person. If you can, drop the top and go for a cruise on a warm summer evening, I guarantee you'll hear the seductive whisper.